There are many definitions for the word Hero. Some people think of Superman. Yet, only one is realistic and represents courage, inspiration, perseverance, and faith. A great definition of a 'Hero' is - hero can be an ordinary person who does extraordinary things." A hero does not have to be superman. Amelia Earhart, my hero, has all these important characteristics. She was born in the little town of Atchison, Kansas, on July 24th, 1897. On December 28th, 1920, she took her first plane ride at the age of 23. Amelia was about 40 years old in 1937, when she died. She disappeared on the route to Howland Island (halfway between Hawaii and Australia), yet with a short life, she still managed to break mankind records, write bestseller books and inspire many people. 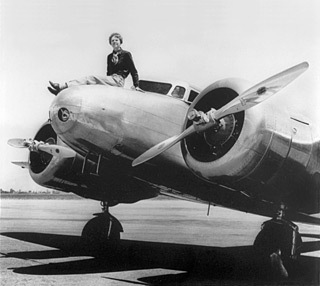 Amelia Earhart has an amazing amount of courage and perseverance to take many risks. She wrote "Women must try to do things as men have tried." What was it that she did to become so heroic? It's not just that she was the first woman to fly across the Atlantic Ocean, but she was the first to fly across the Atlantic Ocean solo! 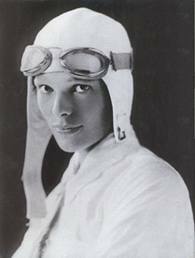 Amelia Earhart is meaningful to me very much. She flew her plane just a little after women in the USA were allowed to vote, go to combat, fly planes and other rights. She made a big difference in the world! I would like to be like Amelia Earhart because she had an influence on herself and others to try things that haven't been done before. "You don't have to be bitten by a radioactive spider or hit by a comet to be a super hero." --Dylan Sprouse. I believe Amelia Earhart was not just an inspiration or just a random fact in time, but was a pure hero who deserves her place in history. Staisil. "Yahoo Answers." [Online] Available http://answers.yahoo.com/questions/index?qid=2011060113343AAnU2UV.